The dream was to fulfill the promise made to each other almost twenty years ago – that if we ever had our own label, it would be together. The philosophy was to create a brand that was a unique blend of fashion and function – essential, hardworking clothing that was more about eternal style than ephemeral trends. The mission was to democratically include #EVERYWOMAN, because we wanted to respond to a culture that has systematically dictated what desirable beauty in fashion looks like, representing very few women whilst excluding anyone who didn’t fit certain long-standing stereotypes. Inclusivity was the message, and we wanted to present it with clothes that didn’t shout ephemeral “fashion” but whispered “timeless” style. Diversity, now a hackneyed hashtag, is the cornerstone of this mission, and we believed in this before it was cool to do so. 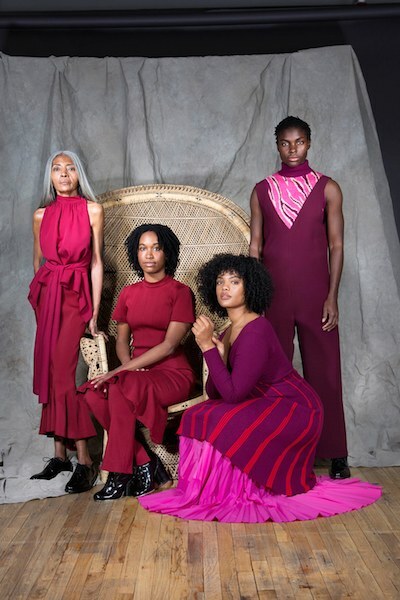 Representing the many faces of women across race, age, size (and income) is no mean feat for any brand to pull off, though we humbly began with this less than humble mission. Women from all walks of life have very touchingly told us how seen they feel by what we have done, launching with trans model Andrea Pejic, the multi-ethnic Rachel Rutt, and subsequently featuring womanhood in so many of its varied expressions. While most brands ignore size and age diversity, we fought with many model agents and casting directors who tried to prevent us from representing every woman, whom we do not discard after a few seasons. So why would two men who make clothes in an industry that notoriously makes women feel bad about themselves work so hard to create a brand that seeks to build women up, and not tear them down so that they go out and buy more ‘stuff’? The editor of The Frontlash, Laura Jones — an old friend, former colleague, and flatmate — recently reminded me that I had shared with her over time the influences on my staunch feminism. I grew up watching my mother suffer and sacrifice to fulfill duty and obligation. I went to a school where female teachers took me under their wing, and girls protected me from bullies and a general feeling of ‘otherness’ in the playground. I became obsessed with strong female popstars like Madonna, and then in my teens female artists like Shirin Neshat (now a friend) and Louise Bourgeois. To this day the work of female art makers informs each collection of Tome. In my adult life, female healers of every description have guided and protected me like those teachers and schoolgirls years before. One of those healers once told me she found almost no trace of misogyny in me and that was rare of men and many women. This was a proud moment. I understand the power of women because it has touched me so closely throughout my life. I have always taken ‘shelter’ in womanhood. They understood and understand my vulnerabilities and have helped me become the man I am today. From the inception of the brand, we practiced ethical and transparent manufacture in NYC. We began with female first owned and operated factories that we still work with to this day. In 2013 I met Katie Ford and found out about her foundation Freedom For All (FFAF) and her tireless work fighting human trafficking around the world. In an effort to support and amplify her voice we started the White Shirt Project (WSP) in 2014, currently in its fifth incarnation. Incredible women such as Iman, Solange, January Jones and Uma Thurman have all helped promote it, and over a thousand women have bought shirts in support, donating much-needed funds and more importantly attention to FFAF. WSP was our first step toward a sustainable manufacturing practice. It was the first time we coupled our ethically transparent supply chain with ecologically sound raw goods and have progressively moved our entire business in this direction ever since. We have since added artisanal partnerships with women’s collectives in India and Peru, which support environmental, educational and ethical solutions for working women (and their children) in emerging worlds. Why? Because it matters to us. Because selling white shirts to mostly white women in affluent countries isn’t enough to make a difference in the world. Because wearing feminist slogans on your sleeve is tokenism if those t-shirts are made using cheap or slave labor. Because we have to care about workers in cotton fields working amongst harmful pesticides and should only work with farms, growers, and mills that work with safe solutions. Because it matters that women who farm and spin Alpaca in Peru face disturbingly high rates of domestic violence whilst raising and educating their children. Because less water waste, pollution, and less consumption are important in India where clean water is not a basic amenity. Because true intersectional feminism demands awareness of the needs of all women on planet earth, especially those involved in the process of making our clothes. Because representation and using your voice or platform is key in the troubling times we live in. Because as the decision makers in our industry chose a trajectory that puts people and planet above profit. Perhaps this came naturally to us, but it’s not as hard as one may think. Small business especially can move the needle towards sustainability by making very simple fundamental cost-effective decisions without the demands of corporate greed. Because I am a true feminist who believes in and cares about the rights, power, and voice of #EVERYWOMAN.